In my last blog I asked you all to pray for many who are suffering. Thank you ! If you have not had a chance to pray, please look it over as we all must continue to pour our prayers upon the multitude who are suffering. In that blog, I spoke of a friend I went to see at the hospital who was just told there was nothing more the doctors could do for her stage four breast cancer. I mentioned how I had gone and prayed with her. In the two weeks since that blog, she passed away and the funeral was held. It went so fast. I thought she may have had a few months but really she had only a few remaining days. I feel so blessed to have spent time with her. I saw her three more times since the last blog. During one visit, I accompanied my Priest friend to see her. He administered the Anointing of the Sick and gave her the Apostolic Pardon, which the Catholic Church teaches allows someone to die without spending time in Purgatory—a complete absolution of sins and purification. Unfortunately, by the time he came, she was so out of it that she did not know what was happening. The second time I saw her she was out of it again; I did not stay long and when I left her room, I said, “I love you Michelle.” Those four words were the last I will ever speak to her in person because two days after my visit, she died. Six days later I saw her for a third time resting in a casket. The week has been hard and I have shed many tears for her family and friends’ loss. She was a beautiful woman inside and out! If there is one aspect of the last few weeks that stands out for me the most, it is the love between her and her husband. It is beyond words! As I was standing at her bedside watching her husband put Chapstick on her lips, not because she asked for it—she wasn’t even able to speak hardly, but because there was nothing too small that he wouldn’t do to try to make her more comfortable. He was completely present to her and he spoke to her in the most loving and gentle way. It was clear that she knew she was loved. At the funeral he spoke of his great love for her and said, “Ours is the kind of love people write books or movies about.” And, I believe it, just from witnessing the two of them together during my three short visits. He also said something profound during his speech after her funeral. Instead of cursing God and saying, “why her, why me?” he said he knew God chose him to love Michelle and be there for her through all of this to give her strength. Then he went on to say that if he had to choose between a life of no suffering and no Michelle or all the suffering he’s endured with Michelle, he would always choose Michelle even at the cost of this kind of heartache. It was piercing to hear! I found great wisdom in his words when he said that God chose him for this. It is something I have heard from others who have suffered the loss of a loved one. Instead of blaming God, they see the beauty that God chose them not out of anger or lack of love but because He loved them. As we learn from scripture, God found favor with Mary and yet he chose her to suffer the loss of her son, Jesus Christ. He loved Mary greatly, but He chose her for a special kind of suffering. To the naked eye that does not look like love, but to the Godly eye it is purified love. An abundance of graces were poured upon Mary, and I believe an abundant amount of graces will be poured upon Michelle’s husband and her family and all those who have had to witness a loved one die. This kind of loss between husband and wife, parents and children, brothers and sisters is one that my husband and I reflect on as he nearly lost me a year and a half ago. My experience made it became all too real for us. We have come to the conclusion that this kind of loss is more than our humanity can bear. 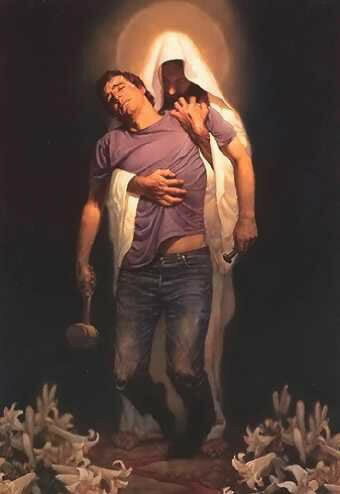 It really is too much for one person to bear which is why it is only possible to get through with the help of Christ. Christ our Savior and Redeemer invites us to lay our crosses, our heaviness, our burdens upon his shoulders; the load is too heavy for us. At the funeral, Michelle’s husband helped to carry her casket, and when I looked back, I realized how symbolic it was. He had been carrying her and giving her his strength through her four year struggle with cancer. He carried her in life and now he was carrying her in death. Just as Michelle’s humble, loving husband carried her in her time of need, Christ wants to do the same for us in our time of need. This is one of the most poignant blogs you have posted! Thank you for reminding us about true love. This is beautiful… It reminds me of my beloved daughter, Bea, who had an incurable neuro-muscular disease that caused her breathing difficulty and who passed away in June 2008. She was 4 years and 5 months old when she re-joined our Creator. My husband and I are also forever thankful to God for choosing us to be her parents here on earth. It was indeed a blessing to have her, who taught us lessons of love, of deep faith and joy in the midst of suffering which we couldn’t have learned any other way… Thanks for all your blogs. Your sharings all enlighten and enrich me. May God continue to bless you and your family! Len, thank you for sharing your story. My heart goes out to you and your husband for your incredible loss. It’s beautiful to hear what you learned from it. May God continue to pour His graces upon you! Thank you for replying to my comment, Melanie. I’m touched… Everything had really been a life-changing and faith-deepening experience for me, my husband & 4 young children (my Bea is our 3rd child). At first, it was hard to accept that my daughter would be sick for life. But God, in His goodness, helped us accept His blessed will for all of us and He gave us all the graces we needed for it. And we were willing to be a part of her suffering. But God ended her suffering when He thought the time had come, she had accomplished her mission… We’ve always believed that it’s all part of His beautiful plan for my family. We all feel honored and humbled at the same time for having been chosen to be my daughter’s family here. And we’ll forever praise God for that… Though it’s painful and we miss her terribly, we know she deserves the eternal joy she has now, with our Father and with Jesus and Mary and with all the angels and saints. Knowing that comforts us. Again, thank you for your reply. And, thank you for the opportunity I’ve had in this comment portion of your page to pour out a piece of my heart… Looking forward to more posts from you. May you continue to be blessed abundantly so you can continue to inspire us with your stories. I will keep you & your family in my prayers.